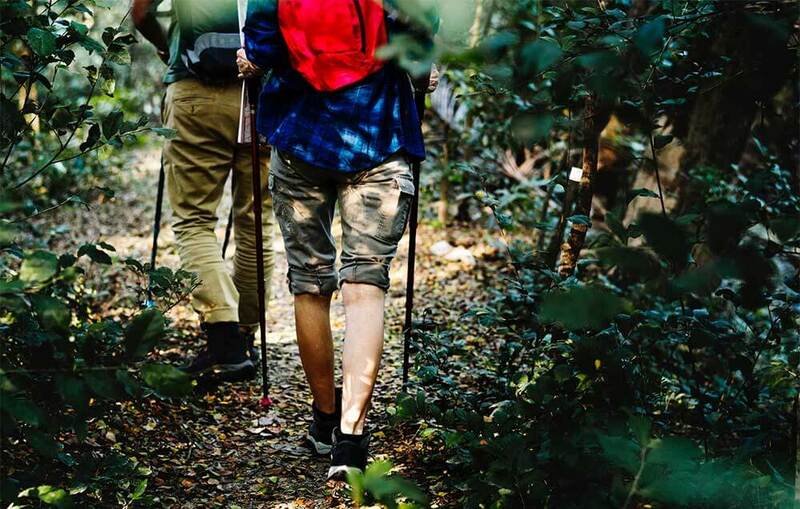 If you’re just starting out as a hiker, or even if you’ve been hitting the trails on the regular this year, you may have been wondering how it stacks up as a healthy activity. After all, there’s a lot of variability in what people consider a hike. One person’s 2 miles on a groomed trail may be another person’s 15-mile-before-breakfast mountain outing. You’re right, though, that hiking really is a great way to enjoy several health benefits. The combination of activity, exposure to nature, and pacing all make it an outstanding form of exercise. Here are 5 reasons it can be one of the most helpful ways to improve your overall health. Hiking is low-impact, boosts your blood circulation, and can be a gradual way to build up your muscle and bone strength. It’s easy to find trails that won’t stress your joints, and easy to incorporate movements that will gently increase your flexibility. For sufferers of Rheumatoid Arthritis, hiking can help counteract the loss of muscle mass that can occur. The fact that hiking can be self-paced is another big help to anyone dealing with arthritis symptoms. You can start off slowly, if you’re stiff. There’s generally more than one way to traverse a stretch of trail, allowing you to pick a less strenuous route. And, it’s easy to use a walking stick or trekking poles, if you need a little extra help with balancing or pushing off. It’s also a proven help for improving your mood and alleviating depression. It’s not just the time out in nature that does the trick – although that alone is very powerful, as studies have shown. It turns out that we may just be hard-wired to need time in nature: 90-minute walks in the countryside were shown to actually calm down the part of the brain that gets active when we’re depressed. Comparable walks in the city just didn’t have the same positive effects. That warm afterglow you feel at the end of your hike may be linked to a happy brain, as well. The type of physical activity that hiking entails is perfect for producing endorphins and boosting your body’s levels of serotonin. Both of these neurotransmitters are important to mood and energy levels. Endorphins are powerful – providing the “Runner’s High” that you’ve heard about – but you don’t need to push yourself through a painful run to experience it – a good hike will work just as well. Serotonin is vital to mental health, and is low in depressed individuals. Hiking will naturally boost it, helping to improve your mood. The mental stimulation of new terrain and sights is also good for increasing energy and creativity. Even though you’re not taking the trails at a run, the cardiovascular benefits of hiking are solid. Using hiking as a regular part of your exercise program can drop your blood pressure 4-10 points. It’s better than walking because of the way your body responds to uneven terrain – the variation in step length tends to increase the overall energy expenditure for the hiker. It’s a relatively easy way to boost your activity level up from a walking routine. If your personal workout style is a less rocket-fueled, and more about taking an occasional moment to actually think about the enjoyment of your experience, hiking is perfect. There’s no competition involved, and the benefits of improved heart health are just the same. For anyone who finds running a bit boring, has joints or other issues that require a relatively low-impact exercise regimen, or hates the gym environment, hiking is an effective way to burn off calories. Of course, the exact number of calories burned is all relative to the size of the person, but generally it’s on par with playing a game of recreational basketball or soccer. Vitamin D deficiency is common in the United States, and even more so during the winter months. Fortunately, for many people, moderate exposure to the sun can naturally increase their Vitamin D levels. Hiking can provide an enjoyable way to get outside, soak up what your body needs to produce the “Sunshine Vitamin”, and get some exercise as you do it. How do you know if you might be experiencing a deficiency in Vitamin D? Symptoms vary, but can include bone aches and pains, tiredness, and frequent infections. The only way to know for sure is to get a blood test from your physician, which will measure your blood levels of the vitamin accurately. As you’re recovering from low D levels, hiking is also a good way to ease back into exercise and strengthen your muscles. If you’re ready to get out on the trail, start slow, be sure to invest in proper outdoor gear, and remember that it is exercise, even at a beginner level. Make sure to stop and stretch beforehand, and don’t push yourself beyond your capacity. If you’re taking your family out, be prepared to adjust your pace to the slowest member of your group. Always remember to put safety first through out the entire hike. You don’t have to get competitive to reap the benefits of hiking. It’s self-paced, and no matter how quickly you progress in terms of your total trail time, you’ll still enjoy better cardiovascular health, stronger bones, joints, and muscles, improved mood, and a healthy weight loss. It’s an easy way to include fitness in your life – and a powerful force for change in your health.